A race run, a dream job landed, a new home, a big promotion, a little victory…It’s one of life’s great joys to see someone you know accomplish what they’ve been hoping for and working toward. 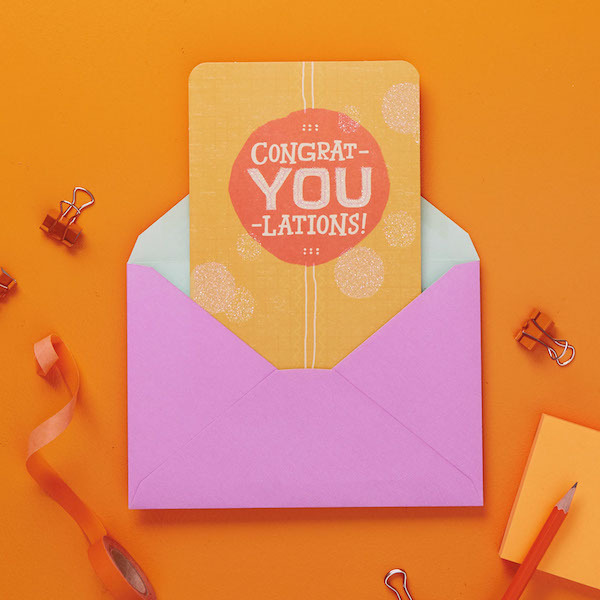 Sending a congratulations card with a warm handwritten message is a perfect way to honor that person and recognize their achievement. In this guide, you’ll find inspiration and personal-message tips for a variety of congrats occasions and recipients. We’ve organized our ideas by what they say and how they say it. Feel free to read the whole guide, or jump straight to the ideas that work best for you and the person you’re congratulating. Oh, and if you’re looking for something a little more specific, we also have tips and ideas unique to Wedding Congratulations, Baby Congratulations, and Graduation Congratulations. The gesture of sending a congratulations card says so much all by itself. And often the card’s printed message says a lot, too. But you can add warmth and personality with just a few words of your own. Writing Tip: The examples above don’t name a specific achievement, but if possible, you should. Your message will mean even more when you congratulate your recipient specifically on their acceptance to Harvard Law School, new job at Google, new boutique opening…or whatever the case may be. “I’m happy for you!” is another warm, enthusiastic message to add to a congratulations card. It’s hard to go wrong telling someone you’re happy about what they’ve achieved. “Hope you’re thrilled about your new job! I sure am happy for you! Writing Tip: A “happy for you” thought can stand alone, but it also works well as part of a longer congratulations message. Writing Tip: The more specific your compliment, the more meaningful it will be to your recipient. A friend’s or loved one’s success provides an opportunity, not only to celebrate the moment, but also to encourage them and look forward to future successes. “Celebrating the record you just set and looking forward to watching you cross your next finish line! Writing Tip: Face-to-face praise tends to embarrass some people, but a written message removes some of that immediacy. That’s the beauty of a card. So go ahead and gush a little in what you write! If you know of some inspiring words that would speak to the proud moment and honor your recipient, then quote those inspiring lines when you sign your card. “The talent of success is nothing more than doing what you can do well; and doing well whatever you do…” —Henry Wadsworth Longfellow It really warms my heart to see you succeeding like this. Congratulations! “The reward of a thing well done is to have done it.” —Ralph Waldo Emerson Congratulations on a job VERY well done! “I have fought the good fight, I have finished the race, I have kept the faith.” —2 Timothy 4:7 (ESV) Here’s to you, fighting the good fight, and coming out a big winner! Writing Tip: These little variations on “congratulations” make nice additions at the end of a longer message, too. They work like happy punctuation! A warm closing is like the frosting on the “Congratulations” cake. Choose one of ours, or create your own.